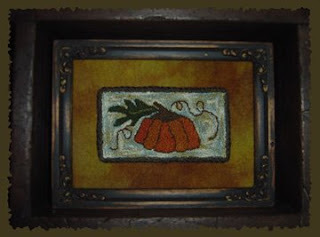 Aunt Polly's Blog: Happy Fall!!!! Something new that I'm playing with ... vintage dominoes ... they're ADDICTING!!!!! It's hard to see the soft, ink stained colors of the dominoes. Hand stamped with permanent ink, little "alters" here and there, wired beads or abalone shells, hanging from cotton hand twisted cordings or ball chain. $15 each ... drop me an e-mail if you'd like to see a closeup picture. 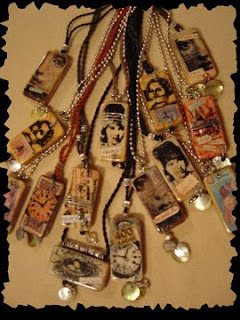 UPDATE 9/22/08 ... all of my altered necklaces have been spoken for. Yippee!!!! My thoughts and prayers go out to those affected by Hurricane Ike. Living in northern Illinois and never having encountered a hurricane, it's hard to comprehend the pictures we're now seeing of the devastation. My heart goes out to those affected. Hey, T..I love the dominoes, you are into everything! !...Can you post the banana bars and icing recipe pretty please?